Crush the cracklings with a mortar and pestle. Alternatively, you can run the cracklings through a meat grinder, or chop them up with a knife. Peel and finely chop the onion, and mix it with the cracklings. Transfer the crackling paste to a pan and cook on medium heat for 5 minutes. For the dough, mix all the ingredients in a large bowl and knead until the dough is smooth and soft. 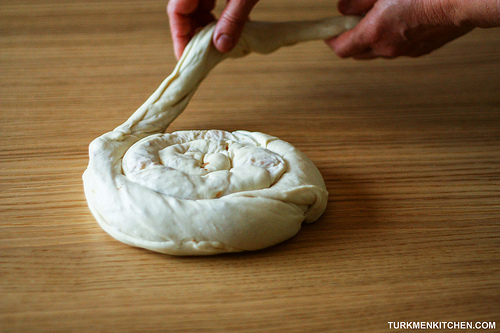 Divide the dough in half and roll each half into a ball. Cover with a kitchen towel and let rest for 5 minutes. On a work surface, roll out one piece of the dough to 5 mm thick. 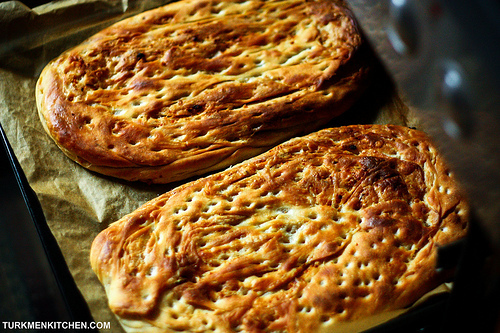 Spread half of the crackling paste evenly over the dough. 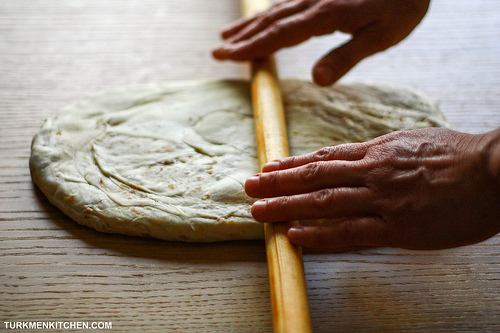 Using both hands, gradually roll the dough into a tight log, and then roll the log into a spiral. Repeat with the other piece of dough. Cover with a kitchen towel and let rest for 10 minutes. Preheat the oven to 250°C (482°F). 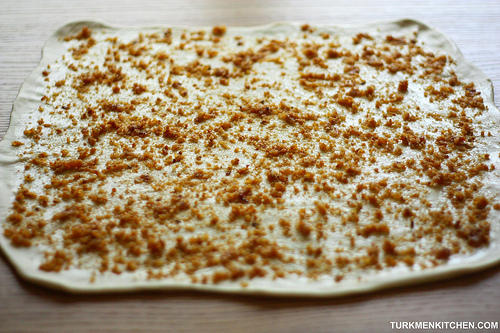 While the oven is heating, roll out the dough with a rolling pin into an oval (about 1.5 cm thick). Transfer the breads onto a baking sheet lined with parchment paper, poke holes with the handle of a wooden spoon and brush with water. Bake on the middle oven rack until golden brown, about 15 minutes.